Over the years, mobile apps have evolved tremendously to become the primary source of information and communication for most of the world. 2016 was a game changing year where several businesses have built their own apps and witnessed the growth of app revenues across various industries. According to Gartner research, 2017 will also be another ground breaking year where the app revenues are expected to generate $77 billion and 50% of small businesses want to build more mobile apps. This will also result in the demand for enterprise mobility apps. 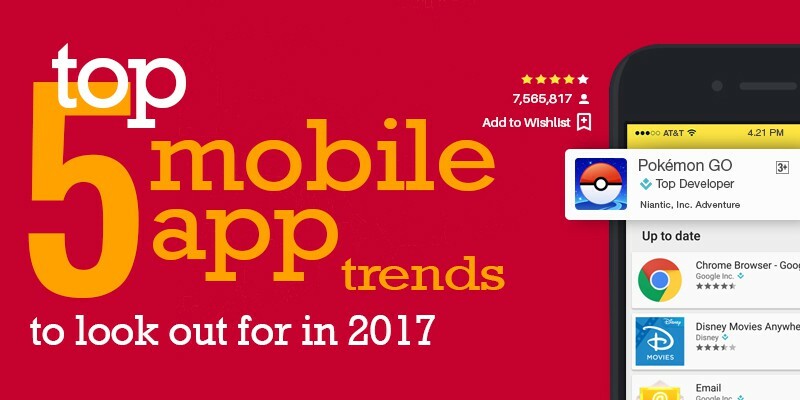 While 2016 was a great year for mobile apps, let’s take a look at some of the top trends for the mobile app industry in 2017. Virtual Reality (VR) and Augmented Reality (AR) apps have already become trending buzzwords in the industry.These concepts which were once science fiction have finally become a reality. Several industries like retail, gaming, healthcare, education, and so much more have begun to adopt VR/AR in order to revolutionize and enhance customer experience. The VR/AR market is predicted to grow $162 billion by 2020. Pokémon Go is the ideal example which attracted millions of users and enabled them to embrace AR more closely. Users prefer more Location Based Services (LBS) that will help them to easily locate nearby restaurants, events, shops, track cabs, and more. Top notch companies including Microsoft, Google, Oculus (Facebook), Magic Leap and IBM are spending billions in the VR/AR market. It’s estimated that the AR/VR market will grow to $162 billion by 2020. That’s nearly 181% annual growth. Having said this, the years to come are going to be fabulous for companies that have enough expertise in augmented reality app development. If you’re looking to implement BYOD or enable apps using technologies like IoT and AI, then cloud supported back ends are the ideal choice. With containers like Docker getting widespread support, cloud deployment and transition will become easier in 2017. 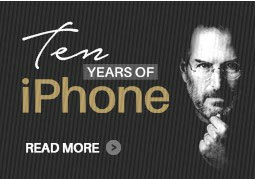 According to predictions, there will be 4.77 billion smartphone users in 2017. With such a huge demand, the mobile app industry can be highly vulnerable to security threats. In June 2016, around 32 million twitter accounts were hacked. Even recently, there was a widespread cyber attack that affected popular websites like Twitter, Netflix, Spotify and more.Even the Democratic party was hacked during the 2016 elections. In order to reduce such security attacks, mobile app developers will need to add two-factor authentication and adhere strictly to protocols while storing users’ personal details especially banking information. As always, Apple does not compromise when it comes to its user’s security concern. Come January 1, 2017, the company will implement App Transport Security (ATS) where all their apps will run through a secure HTTPS connection. Similarly, Android will also strengthen their apps system with automatic security updates and other advance security features. Google is already working with OEMs to provide timely and periodic updates for their Android phones. As wireless innovations are evolving at a faster pace, 2017 is expecting to experience many more connected devices and explore IoT by leveraging mobile apps. It’s estimated that by 2020, there will be 21 billion connected devices. Using mobile apps, you take charge of operating and interacting with all your IoT enabled devices. IoT empowered by mobile apps is going to change the way people perceive and interact with technology. IoT will also create a plethora of opportunities for industries to contribute in experimenting and building a future that embraces technology. The huge demand and cost to hire skilled developers have increased the growth of citizen developers. Some of the top tech giants like IBM and Microsoft are encouraging DIY concepts as it increases productivity and helps them to efficiently utilize their existing resources. Now that you’re aware of the upcoming trends that will rule the mobile app industry in 2017, our mobile app developers are ever-willing to help you develop your dream apps.